After a slow start to the year, many leading indicators are pointing to a stronger economy this spring. Real wage growth is now stronger than we have seen in two-and-a-half years, thanks to higher wages combined with subdued inflation. Consumer spending rebound: Consumers retreated from spending at the end of last year because of political and economic factors dimming their confidence. With improving sentiment, consumers are likely to spend more in the spring. Tax refunds and used-vehicle spring bounce: While tax refunds are down in total compared with last year, the averages obscure the disparate impact on households. See my recent post: Even With Tax Refunds Down, Data Point to Improving Used Car Market The used car market looks to be a beneficiary with many of its core constituents receiving at least normal if not better refunds, albeit delayed. We are seeing clear signs of the spring bounce in used vehicle prices materializing. Dealer sentiment and outlook rebounded as well. 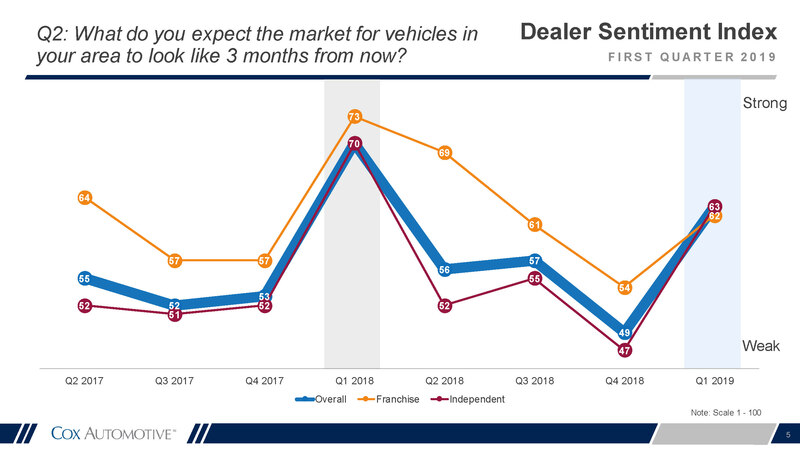 See more details about how dealers are feeling: Cox Automotive Dealer Sentiment Index – First Quarter 2019. Yet, the improvement may not be translating to new vehicle sales like the improvement seen in used. As a result, we’ve seen the gap in optimism between Franchises and Independents close as Franchises have become less optimistic and Independents more optimistic. Trade wildcard: The biggest wildcard hanging over the auto market and the broader economy remains what becomes of trade. A deal with China could turn the global economy around, while the implementation of a 25-percent tariff on autos and parts from Europe and Japan could create a rush to buy before a subsequent big decline in sales. Looking ahead: This week, we’ll have data on existing home sales February, updated tax refund data, and the March Federal Reserve Open Market Committee rate policy decision.